This entry was posted in General News, Members, Retirees and tagged beneficiaries, benefits, death, Death Benefits, death certificate, ERS, Information is the Key, members, Notification of Death, NYSLRS, NYSLRS Retirees, PFRS, Reporting a death, retirement planning, survivors on April 13, 2016 by NYSLRS. Unless I’m just not finding it, it would be nice to have a “print” button so that the form could more easily be printed to put with important papers. Thank you. We’ll keep this in mind for the future. Please have a Hispanic person contact us thank. We’re sorry, we can’t look up your retirement information. Please email your question using our secure email form. Please allow five to seven business days for an answer. Taxes on death benefits vary depending on the specific type of benefit. You can find details on our About Death Benefits page. If you would like account-specific information, please email our customer service representatives using our secure email form. One of our representatives will review your account and address your questions. Filling out the secure form allows us to safely contact you about your personal account information. Please allow five to seven business days for a response. Can I get the paper brochures mailed to me? If you would like a paper copy of our brochure Getting Your Affairs in Order/ A Guide for Survivors, or any other NYSLRS publication, you can request it by emailing our customer service representatives using our secure email form. One of our representatives will review your request and get back to you. We are sorry for your loss. If you haven’t already done so, please call our customer service representatives (1-866-805-0990) to let them know that your brother has died. You can provide the agent with his daughters’ mailing addresses. After we receive a certified death certificate, we contact and provide forms to any named beneficiaries or to the executor of the estate. My Mom was a NYS worker. She retired in 1999 and she passed away August 15th, 2018. I don’t see anything on the “About death Benefits” page for retirees. any info would help out alot. Thank you. We are sorry for your loss. If you haven’t done so already, please call our customer service representatives (1-866-805-0990) to let them know that your mom has died. They will be able to walk you through the next steps. There are a few possible death benefits that may be available to NYSLRS retirees, depending on her retirement plan, her employer and the pension payment option she chose at retirement. 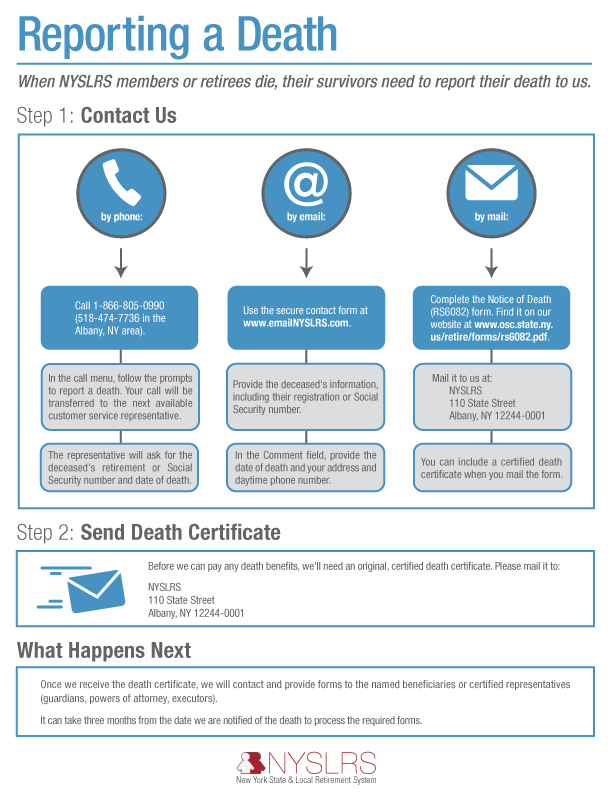 Once we receive a certified death certificate, we contact any named beneficiaries or the executor of the estate to let them know what death benefits are payable. You may also find the second part of our Getting Your Affairs in Order and A Guide for Survivors publication useful. My mom passed away on July 3rd, 2018. Every step of the retirement death benefit process has taken longer than the posted timeline. I sent off the signed and notarized letter claiming my benefits (the last step before receiving the check) last week and was told today that it would take ANOTHER 4 weeks to process the check. That will make it 18 weeks since my Mom passed. The lady that I spoke with in customer service just told me that the usual timelines don’t apply because they are backed up. Then why not let us know that? But 18 weeks for a death benefit? That’s outrageous. I need help. I sent a fax to the survivor services unit as advised by customer services. What now? My loved one died on August 8, 2018. I notified them on August 15th. They were able to stop his retirement benefits in Sept. I was told it would take about 3 weeks to process the forms that I would need to complete, get notorized & return; then another couple weeks until benefits would start. It’s December 10th (about 16 weeks later) and I have not received the forms to complete or other information about getting beneficiary monthly payments. I’ve called about 6 times and customer service says that they have everything they need, but to call back in 2 to 3 weeks, if I do not receive the forms yet.